I am so excited to be joining Scattered Thoughts of a Crafty Mom for her Holiday Sewing Blog Tour. We do a lot of cooking in my family especially around the holidays. 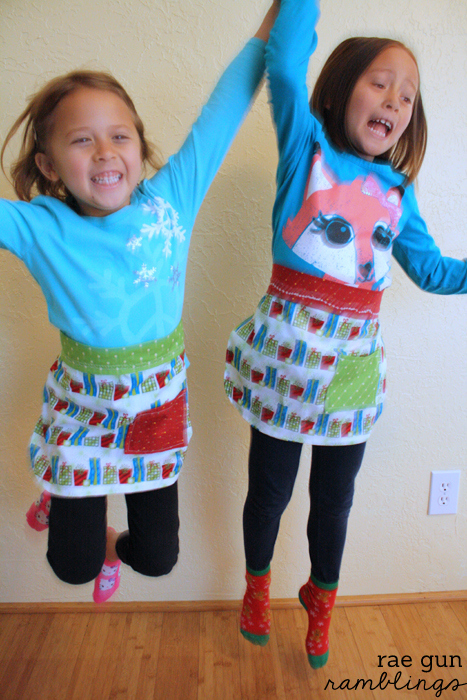 I wanted to make my nieces some holiday aprons but then I decided that the project was SO simple that I wanted to teach them how to make their own aprons. I’ve hinted about it before but I’ve been teaching them how to sew and it’s been awesome! I’ll do a whole post about what has worked but all of that is to say that this project is easy enough for a 5 and 6 year old who barely can handle a machine. 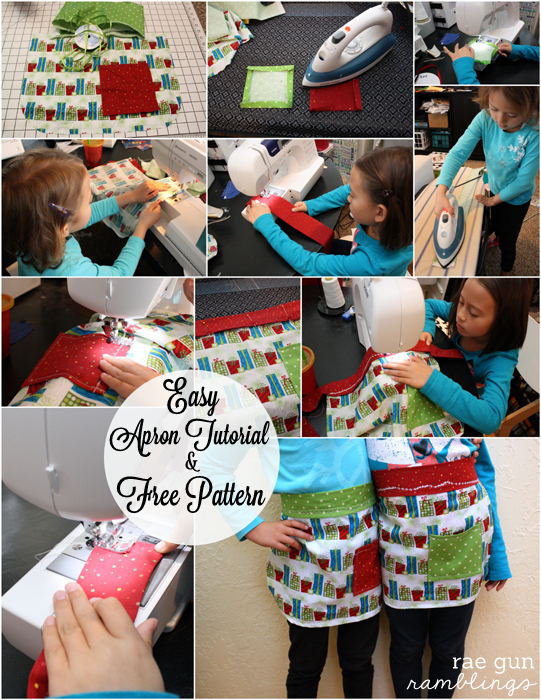 If you are comfortable with a sewing machine I think you could make this in 10 minutes. If you’re super cautious and not yet comfortable with a sewing machine I still think you can do this in 30 minutes! Main apron fabric 17 X 11 inches A fat quarter should work unless it is a directional print. Cut all apron pieces. My main apron pattern piece is mostly an 8.5 X 11 inch paper with a curve at the bottom and then cut on the fold. 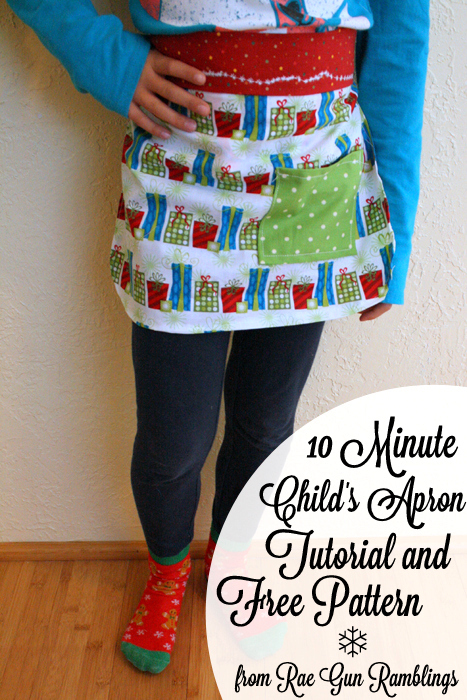 You can make your own with that same idea or get my child sized apron pattern. Start by ironing the edges of your pocket piece down about 1/2 inch on all sides. Sew along one edge with a 1/4 seam allowance. This will be the top edge of your pocket. With right sides together iron you strap piece in have lengthwise. With a 3/8 seam allowance sew down the long edge of the folded strap along the raw edge. Flip the strap right side out and iron. Next serge or zig zag around the edges of the main apron fabric. Fold under, pin, and sew down the sides and around the bottom. For a prettier finish fold twice. We only did one fold and they are fine. Pin the pocket to the front of your apron how ever you would like and sew down the three edges leaving the top edge open. Next pin the waist band to the apron main piece overlapping about 1 inch. Sew to attach the waist band to the apron main piece. We used fun decorative stitches. Lastly tuck in the ends of your strap and sew a row of stitches across to close. Tie on and bake something awesome! The girls were so proud when they finished their aprons. They aren’t perfect but they are getting more confident and it’s so so fun to see them create things for themselves! I plan on doing a whole post about teaching kids to sew but I think the most important thing is to use a machine with speed control with decent slow setting. I used both this brother and my Emerald Viking and the Viking is a much stronger and faster machine which was a little harder for the girls to start on. Let me know if you have any specific questions or concerns and I’ll try to answer address them. And don’t get the impression that this is just a kid project I’ve made these aprons myself and I think they would make darling gifts! Check out more from this cool Holiday Sewing series and check out the awesome serger giveaway that Jamie has going on as a part of this. 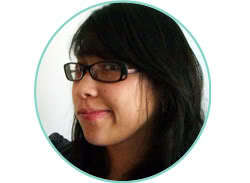 Here’s a peek of what’s in store. 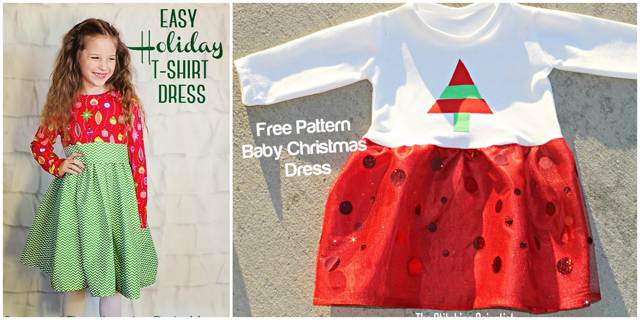 Yesterday Jamie kicked things off with an Easy Holiday T-Shirt Dress and tomorrow The Stitching Scientist will be sharing a Baby Christmas Dress with a Free Pattern. 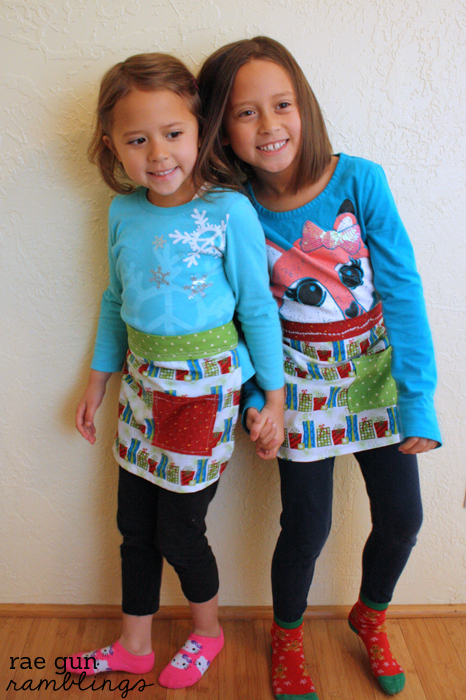 Such cute aprons! I am looking forward to teaching my little missy to sew when she is ready. How old are your nieces? I love the sewing photo montage. Thanks for being part of the holiday tour! Jamie it’s been really fun to teach them. The little one just turned 5 but she’s one of those very clever kids and has been wanting to learn for a while now and then the older one is 6.5. Thanks so much for having me on the tour! These are so darling! The perfect Christmas gift for a little one! These are SO cute! :) I think I might make one for my 5 year old. Thanks!! Thanks Catie, you totally should they come together so easy and the girls love using theirs.